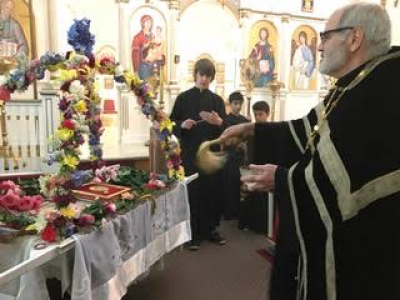 On Sunday, December 10th, after Divine Liturgy, we had our annual celebration of St. Nicholas. Father gave stockings, crafted by our Ladies' Group, to all the children present. If you have been past St. John the Divine recently, you will notice a new parkette, directly across the street from St. John. Use of the parcel of land was donated by the local businessman who owns the property. It is outlined by a short brick wall. Inside the parkette are memorial bricks, commemorating loved ones who have passed, people & organizations from the area, and even our own community, "St. John the Divine -- Celebrating 100 Years". Unfortunately, there was an act of vandalism in the parkette this fall -- someone set afire a grocery cart which melted a bench, and defaced a whole group of memorial bricks. What to do? It was felt that it was time to set up a security camera to watch the area of Richmond Street & Drouillard Road. How to do it? 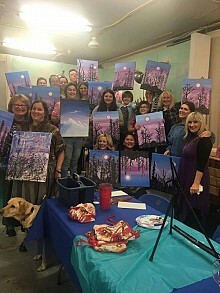 The Ford City Residents Association's Safety & Security Committee sponsored a Pour & Paint Party at Atalier Virginianne, where attendees paint their own rendition of a painting, prompted by a local artist. Proceeds from this event are to pay for the security camera, its set-up, and maintenance. 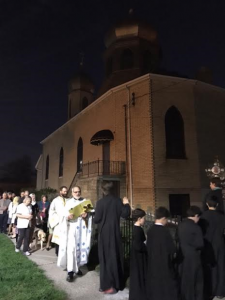 The community of St. John the Divine came out in support of this effort with about 11 people attending, either from our community directly, or because of generous donations by members of St. John. Attached is a picture of our finished masterpieces. A great time was had by all! 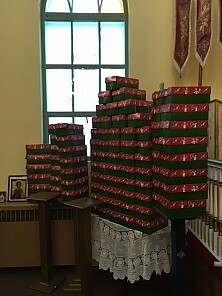 Preparing and sending shoe boxes via Samaritan's Purse is a yearly event at St. John the Divine. Since 2007, we have been filling boxes individually, and also through packing parties, where many gift items are brought in by our parishioners, and we create boxes for young boys and girls. This year, we filled 87 boxes! From St. John the Divine, they were taken to Gethsemane Lutheran in Windsor; next stop is Guelph, ON. Then the boxes are sent in shipping containers to areas of the world where children have: 1. never received a Christmas present, and 2. have not heard the life-changing story of Jesus Christ and the Resurrection! Let us prayer for those children who receive our boxes; let us pray that they come to love and honor Jesus Christ as their Lord and Saviour! 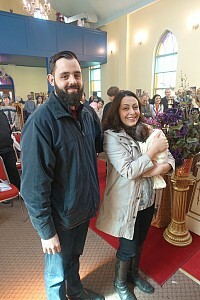 Travis, the son of Alison & Shaun, and brother of Anita, was baptised on Saturday. 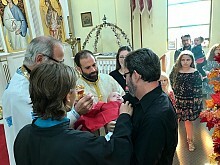 Following are some photos of his first reception of Holy Communion at Divine Liturgy on Sunday. 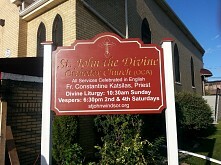 Thanks to a generous donation from an anonymous donor, we got a new sign at St. John. Facing diagonally towards Drouillard and Richmond Street, we hope that it increases our visibility in the neighborhood. We love it! lessons, crafts, songs, and even fruit. 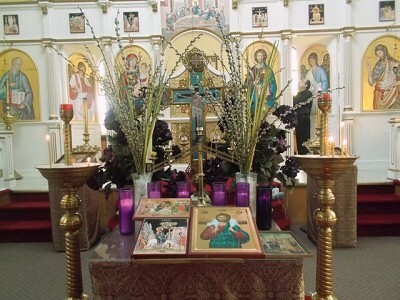 Various pictures from our Holy Week Services. 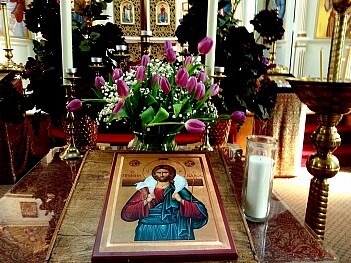 Featuring a couple of pictures from our celebration of Palm Sunday at St. John the Divine this year. After her time of confinement, Mother, Sally, with her new baby boy, Gabriel, is welcomed into Church. 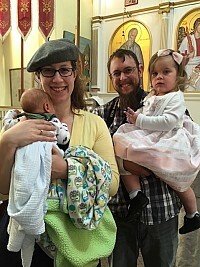 Shaun made the decision to become an Orthodox Christian, as are his wife and daughter. He made his profession, and renunciation, and is more that half way there to be chrismated. 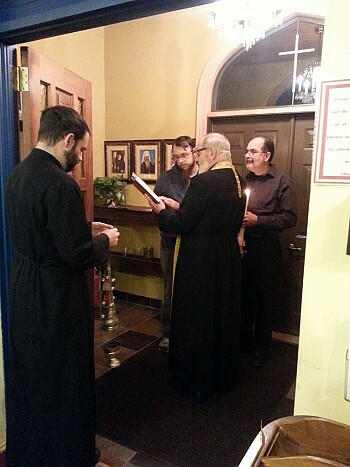 We had the service of the BLESSING OF THE WATER on Sunday Jan. 8.